Just weeks away until Doktor A flyes over for Designer Con 2017! DokA the veteran of Dcon will once again bring a whole load of Mechtorians and Copper Creeps goodness. DokA debuting his all-new “Geoffrey” sculptures too. Heres a sneak peek at what you can expect at DokA’s upgraded booth. “Geoffrey” sculptures is DokA’s rendition of the Ape Butler of infamous Steampunk Rapper Professor Elemental. I will have a very limited number of these 3″ resin figures available in either Bronze or Pewter finishes for $45 each. I will also have these unique painted Copper Creeps in a deep red and black colour scheme. These have been created just for this show and there is only one of each available. They will be $100 each. As well as the red versions there is also a matching set in Green. So you can add a unique hand-painted classic movie monster to your collection. Choose from (L to R) The Monster, Vlad, Orlock, The Bride, Imhotep or The Wolfman. Each hand cast resin monster is $100. 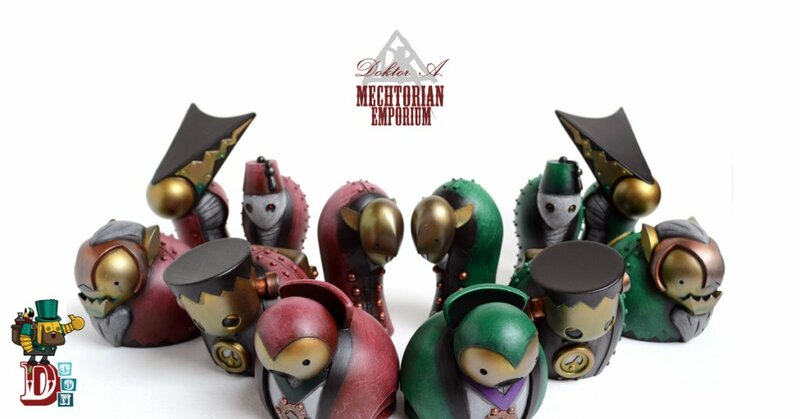 DokA will also have one each of the Todd Morden Mini Mechtorian resin figures. Only these three pieces have been made for the show. Green, Red or Purple, each with a winding key. $100 each. Also for the first time at an American convention, series 4 of Copper Creeps will be available. Featuring The Phantom and The Gillman. I will have them in the limited edition handpainted Mono versions ($100 each) as well as the Bronze and Pewter versions ($50 each). As well as all these new items I will have the full range of Copper Creeps, Many Mechtorian toys and resin figures, Original ink drawings, Prints and postcards, Pin badges and other delights.